AMETEK Grabner Instruments has added a new lube oil and grease analyser to its portfolio. The MINISCAN IR LOG is a highly versatile and extremely fast FTIR analyser, designed for on-site condition monitoring of oils and greases, and capable of measuring low or high levels of water in oil accurately and quickly, without using hazardous reagents for sample preparation. Lubricating oils and greases play a key role in the performance of today´s high-value machinery and motors. By reducing friction and wear between moving parts, they guarantee long-term economic and profitable operation of machinery used in industrial, petrochemical, and power generation plants, and by the mining and other industries. Lubrication oils and greases help preserve and protect vehicle and marine engines, both commercial and military. If the condition of the oil and grease is not monitored continuously, additional costs are inevitable. The failure to predict oil degradation can lead to motor-repair expenditures that easily sum up to several hundred thousand dollars per year. An equal amount of costs can accumulate if oils and greases are changed too early. The quality and the costs of todays´ oils also are increasing, and the premature exchange of expensive oils for naval vessel, automotive fleets, wind farms and other large oil and lube consumers can have a severe effect on business profitability. Those users need to consider the purchase of a condition-monitoring instrument that allows them to check lube oil and grease quality directly on-site and that facilitates a timely and accurate response to oil degradation, which can add up to a significant hard-dollar-saving investment. 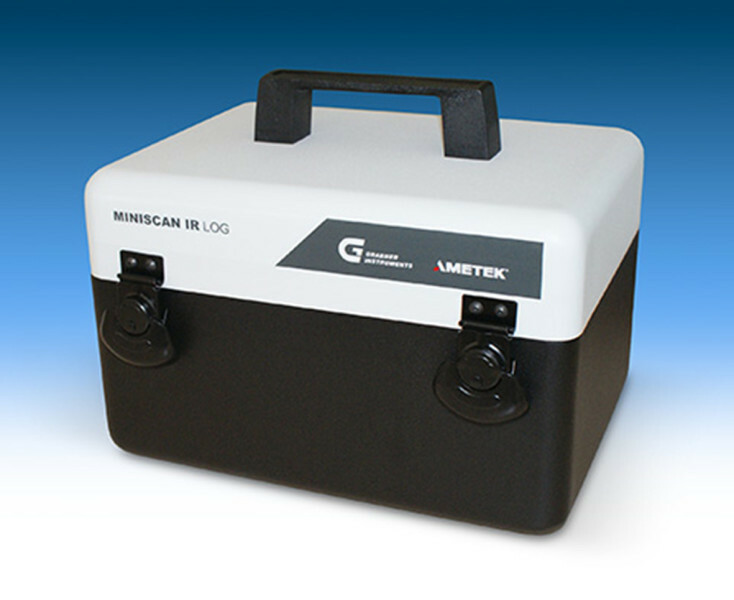 The compact, robust MINISCAN IR LOG FTIR analyser from AMETEK Grabner Instruments is uniquely designed to match the requirements of the lube oil and grease industry. Only one drop of a sample is required to accurately measure numerous oil and grease performance indicators. Depletion of anti-wear oxidation compounds and additives, as well as sulfate, nitration, soot and water levels, can be measured, and pass/fail information is displayed within minutes. Preconfigured methods can be easily selected for measuring different types of lubricating oils, and the measurements can be done by untrained personnel. Because the sample is directly applied to the measuring cell, rather than flowing through the cell, the instrument´s performance is not limited by a sample´s viscosity or by particle contamination that can harm the measuring cell. Cell rinsing is not required. The cell can be cleaned with a simple tissue, and no chemicals are needed to perform reference measurements. The instrument features a unique dial-path setup, which allows easy switching between sample cells. Three different path lengths are pre-installed: A 50-micron sample cell for quick screening, a 100-micron cell for ASTM and EN compliant measurements, and a 1000-micron cell that allows the detection of very-low levels of additives or contaminants in oil. This setup guarantees that the instrument conforms to and exceeds precision requirements specified in various ASTM, EN or IP methods. The MINISCAN IR LOG adds further value by being able to determine low or high levels of water in oil, offering a perfect alternative to Karl Fischer (KF) titration. The FTIR analyser reduces measurement time to minutes. No hazardous chemicals are required for testing, and the results are as analytically accurate or better than KF titration. Measurements are very easy to carry out and do not require special training. Versatility, ease of use and the possibility to measure oil and grease directly on-site and in real time make the MINISCAN IR LOG a perfect solution for monitoring lubrication of engines, generators or turbines, as well as determining the degradation of hydraulic and transformer oils.